Power Adapt Portable Swing - Braden is rated 4.5 out of 5 by 22. Life isn’t lived in one place. When you have places to go, the Braden Portable Swing is easy to take with you. The compact frame is easy to transport, with all the same features you’d expect from a full-sized swing. Your baby can rest easy while enjoying automatic swinging motions, listening to soothing nature sounds and melodies, and reaching for the plush hanging toys. Designed by Ingenuity for optimal ease of use, you can enjoy the dual benefits of plug in technology and batteries – use the AC adapter when near an outlet or switch to battery mode when away. You don’t have to sacrifice function with this mini swing. The 5-point harness and non-slip feet ensure your baby’s safety, and comfort is in full swing with the ultra soft seat pad. The swing grows with your baby thanks to weight-adapting technology, and the extra head support can be removed when baby outgrows it. 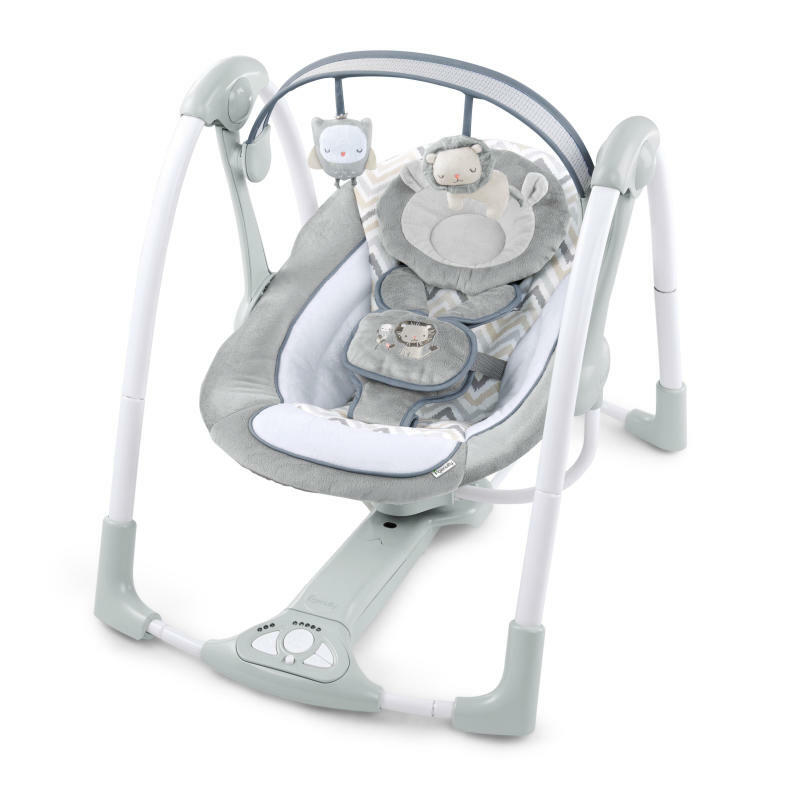 Your baby’s happy place can be at home or on-the-go with this swing. Dimension (in) 26" x 23" x 22.5"
Seat pad and headrest - Machine wash with cold water, gentle cycle.Toy bar and toys – Wipe clean with a damp cloth and mild soap. Air dry. Do not immerse in water.Frame – Wipe with soft, clean cloth and mild soap. Rated 4 out of 5 by jsmith251 from Nice portable swing Overall, this is a nice swing with great options. I also like how portable it is so that we can move it to various locations around the house. The design and toys are gender neutral, so nice to use for boy or girl. Fabric was soft and my baby really enjoyed. Rated 4 out of 5 by Kelly19 from Very soft and comfortable for baby This swing definitely comes in handy when it comes to traveling with the baby often. We are able to quickly and easily fold this up and move it from room to room and from home to sitter and our camp. This swing does not move from the one position it is in, so I probably won't use this when the baby gets much older. She likes the little toys that hang, but they really dont amuse her much. I LOVE that it can either be used on batteries or plugged in. It makes the versatility of it even better. Rated 5 out of 5 by TonyaV from Cute swing The Ingenuity portable swing in Braden pattern is an adorable swing perfect to take on the go or keep at home for baby. I love that it’s convenient to take along because my baby always enjoys rocking. Another great feature besides being portable is that it can be powered by plugging in so no worry of constantly changing the batteries. Rated 5 out of 5 by TonyaV from Cute swing The Ingenuity portable swing in Braden pattern is an adorable swing perfect to take on the go or keep at home for baby. I love that it's convenient to take along because my baby always enjoys rocking. Another great feature besides being portable is that it can be powered by plugging in so no worry of constantly changing the batteries. Rated 5 out of 5 by Beautycole from Extremely quite Love this swing so much. It’s extremely quite, very soft material ever on the straps. The toy bar is also a great feature. Very light weight, and easily folds up. Love the three timers. And the fact that the batteries last way longer then any other swing we’ve owned. Baby seems to really love it which is the most important part! Rated 5 out of 5 by Beautycole from Extremely quite Love this swing so much. It's extremely quite, very soft material ever on the straps. The toy bar is also a great feature. Very light weight, and easily folds up. Love the three timers. And the fact that the batteries last way longer then any other swing we've owned. Baby seems to really love it which is the most important part! Rated 5 out of 5 by Dayana27 from Great Swing, My baby loves it, No Batteries This swing is perfect. It's very compact and does not take up a lot of space in my living room. It also folds up with ease for easy transporting. Also, it comes with an AC adapter so you don't have to keep spending money on batteries. I also love the fact that it is run by magnets...it's soooo quiet!! Rated 5 out of 5 by Birdee from Fantastic for little ones I've had many swing seats over the years, and this is by far my favorite. My little one sits comfortably in it, and it doesn't take up much space. The colors go perfectly with nursery, and it has all the features a new parent could want. It would make a fantastic gift too.